STEVE DAWSON has a mother like St. Monica. The result, combined with God’s grace is a life AWAKENed and from that new life – SAINT PAUL STREET EVANGELIZATION. What? 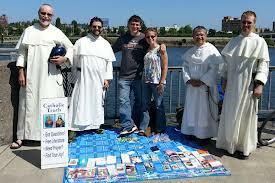 Catholics evangelizing? Yes — now in many U. S. cities and foreign countries. Great story. Great Awakening… Join us for a great idea for the YEAR OF FAITH. This entry was posted in Podcasts and tagged Evangelization, Vitamin A. Bookmark the permalink. What an AMAZING story! Steve sounds like an awesome guy. I hope his work continues to spread!